What does a pile up sound like from the DX end? FT817 ... bringing it back from the dead. In use 2004, one closest to camera. We had a wire dipole strung between them. It takes a picture every 5 seconds or so and updates that webpage (that refreshes if you keep it open). I am going to be changing the shack shortly so it is full of boxes right now. 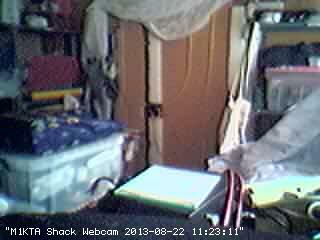 There are a couple of cameras and the images are uploaded to a remote server so for security purposes I have a recording of what is going on in the shack and outside it. 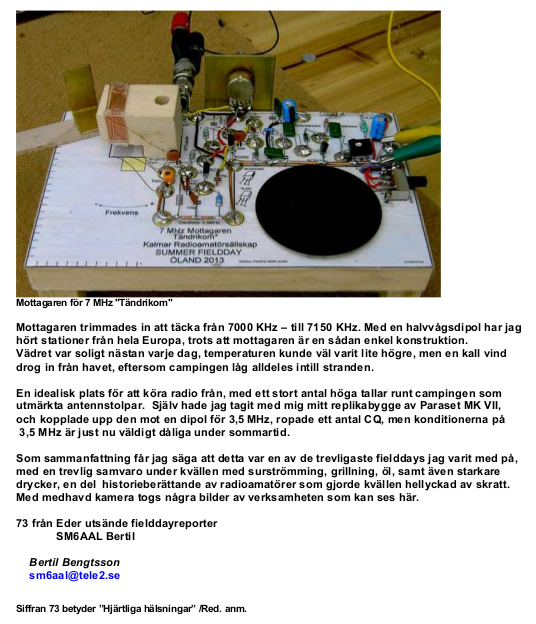 Just sent out buro cards for M1KTA/6W/P and C5/M1KTA. Direct requests had dried up. I was going through old files and found this from one of the places I stopped at on the way. Much of the music (outside the tourist areas at least) uses this sort of story telling. The track was recorded so might not be perfect. West Africa was a lot of fun, did not understand the language, I am sure the story was explained to me at the time, but just listening to it brings back memories. This was by Konte and Kuyateh who play a huge drum with strings and sing along. It is called a Kora. There are known as Jali's, a Jali is a 'storeyteller'and they carry on the tradition much as generations had done before them. Singing about the past and the current situation of their friends, family and country. Some of the 'songs' were a tad political! I had someone local drive me about and he explained that stories and history are passed down from generation to generation by this method within families and groups of friends, ensuring survival of such stories for centuries. This was from a CD of music picked up in one of the cafe's we passed. The music just jumps out at you and after having seen it first hand captures the West African/Mandinka people very well. Memories ... a day away from pile ups... the day started with a long drive through bright red dusty roads, out of Kariba, past the odd herd of animals on the side of the road,a stereo is playing this and others, hanging from a bungee in the cab, it is very hot and sometimes very sunny.... It will rain in a couple hours as it is rainy season and the humidity is about 80% already... there are dark clouds on the horizon and there is a huge thunderstorm building, the static on air was enough to give up after a couple of hours in the dawn. We are on the coast road well south of Banjul near the Sengalese border, just stopped at some fishing shacks and fed on spiced fish and rice..far from the usual tourist places... I understand why the VooDoodes used to come back here year after year, so much to see and every time you go on air more contacts that you can possibly make. So got to find out can I obtain one new or is it a bespoke FPGA thing? Yaesu tech services have said I can get one but might be easier to let them fit it. I think I will be sitting with it on the bench and the service manual and working out if all the voltages are where they should be. (I suspect this has already been done) If the main voltage went high and regulators were damaged then there is a chance the cpu and PLL do not have the correct voltages appearing, or were damaged. Doubtful I can do much more harm to it now so I will remove the TXCO, filter, PA and BHI modules and walk through the service manual and the expected voltages. 50 Fahnstock Clips just turned up for old vintage rigs. (and a few modern creations). The clips hold wires in place and have a pincer action. If you know what they are then it will be great to hear that you can get new ones. Paul was great at sending these to me and accepted paypal. Postage is a bit high (USPS not Paul). but these are hard to get. Paul has the original kit that will make these. SM7UCZ put me onto these. 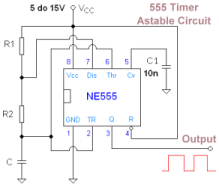 I was reminded that a simple 555 timer can create an astable oscillator that can be used with a DVM to measure a transformer windings when at a rally or when there are no markings. The values for R1, R2 and C1 will give you the frequency and the duty (charge/discharge). Where, R is in Ω's and C in Farads. You might then follow that with a simple op amp integrator to turn the square wave into a sine wave. Or another option without the op amp so a similar small component count is a saw toothed oscillator. Vcc is the supply voltage and Vpp is the Vpp of the output voltage. 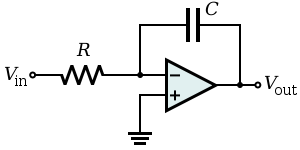 The transistor can be almost any GP PNP. Further to an earlier post where I commented on the component tester I found some more information about them and just put mine into an enclosure. I bought a few desktop console enclosures a while back. Not much needed done just extend the display, add some better terminals and a button. I'll post photos of mine here. Designed originally by Markus Frejek, and pimped out by Karl Kubbler with some cool software mods, this inexpensive little board does some wondrous measurements! Beware of similar items as not all of them are the latest version with resistor matching function and ESR testing ability. Tests resistors, capacitors above 1000 pF, inductors above 10 uH, and many semiconductors and most importantly ESR of capacitors above 10 uF. Very handy for bench testing, matching audio and power inductors and capacitors, identifying semiconductor pinouts and characteristics. Not suitable for most RF inductors and capacitors. 1. Operates with ATmega8, ATmega168 or ATmega328 microcontrollers. 2. Displaying the results to a 2x16 character LCD-Display. 3. One key operation with automatic power shutdown. 4. Battery operation is possible since shutdown current is only about 20nA. JFETs, diodes, double diodes, Thyristors and Triacs. 7. Automatic detection of pin layout of the detected part. 8. Measuring of current amplifcation factor and Base-Emitter threshold voltage of bipolar transistors. 10. Detection of the protection diode of bipolar transistors and MOSFETs. 11. Measuring of the Gate threshold voltage and Gate capacity value of MOSFETs. of its ends, the Tester cannot di er the middle pin and the end pin. 13. Resolution of resistor measurement is now 0:1, values up to 50M are detected. @1MHz clock) to 100mF. The resolution can be up to 1 pF (@8MHz clock]. is only avaiable for ATmega with at least 16K ash memory (ATmega168 or ATmega328). 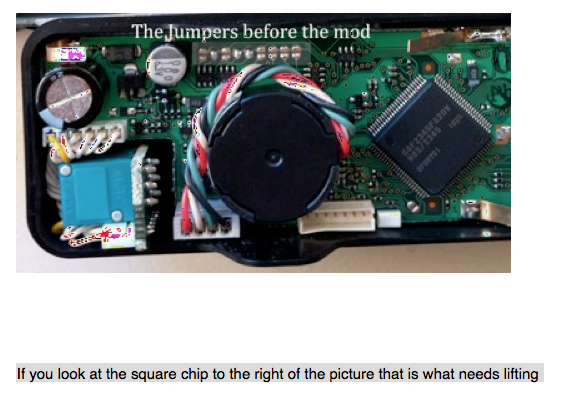 the ux voltages are shown. also detected as two diodes. diode only by the one with break down (threshold) Voltage nearby 700mV! again, one after the other. can also be analysed, if you connect the Base and only one of Collector or Emitter. 21. Only one measurement is needed to nd out the connections of a bridge rectifier. 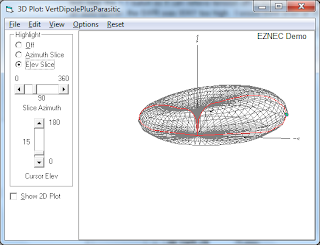 capacity value of the parallel connected part. 25. Software can be configured to enable series of measurements before power will be shut down. clock frequency and wait calls (ATmega168 and ATmega328 only). reference voltage is found to adjust the gain for ADC measuring with the internal reference. I was asked if I had any more info about the long wire I use at qth and I have updated the original post withy some video I took. mini 1 1/4" metal springy (aka slinky) - what on earth can you use these for? I discovered I had two of these mini slinky coils. They are 1 1/4" (c33mm) diameter and XYL had just finished BOTH the tin foil and the cling film so I had a pair of identical cardboard tubes. 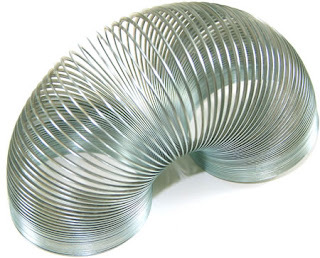 A quick test and I can slide the tubes inside the mini-slinky and stretch it out and connect to it along the length (about 12"/300mm). You cannot actually solder to it but you can wind wire about it and solder that in place. 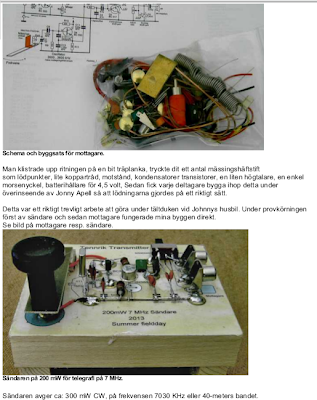 So I am going to make a couple of multi tap inductors for antenna experiments..
Just before Rishworth 2012 I went up on Marsden Moor and had some fun /P with KX3 and a short 6m fishing pole.... was sent an email that I do plenty of IOTA and DX but why do I not do any SOTA. So here is a photo diary of one activation. Cannot remember the hill but was fun and amazing I was in the North of England and it is sunny and dry! Canal path to the start up..
You had to cross this cute bridge. Was used for pack mules (that used to be used bfore the canal tunnel through the hill. That's me hiding in the long grass. Series of QSO with JA, I had the KX3 still tuned to 17m which I had used in KH8 or KH6 cannot remember which now. Walked on and there was this rock thing. 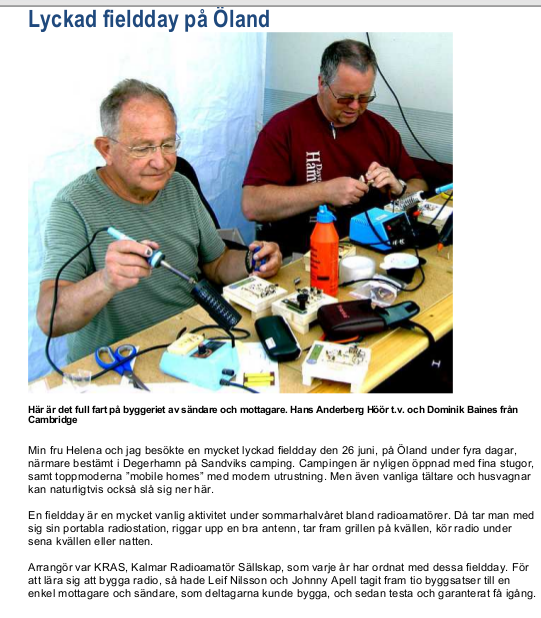 So that is it a SOTA activation. I thought travel to a DX was a lot for a couple hundred qso... SOTA seems like even more effort for maybe 10's of qso. Take along radio kit and it is usually very wet and windy so making qso is not easy. As I live in Cambridge and there are no hills in Cambridge (!) and Stansted airport is closer to me than any hills (figure out the time to get to places etc) so I can do the DX thing much easier than I can get to a hill somewhere. 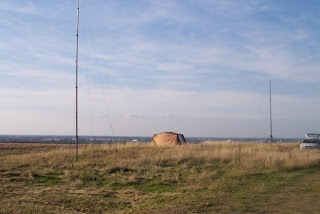 I was intrigued by the antennas of the VP6DX DXpedition and I met up with some of the VP6DX team at RSGB conference in 2009/2010 and asked a few questions about the antennas and more importantly saw some better photos of them. 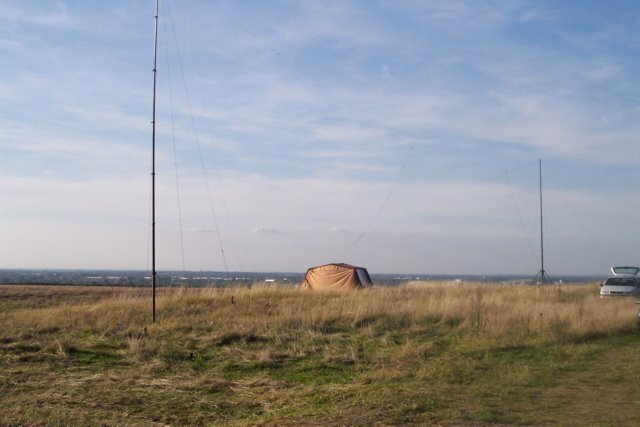 Unfortunately I pretty much forgot the topic in the intervening years but I had bought some 4m poles and then some 6m telepocket poles (search this blog) with the express meaning to make up some of these 2 element phased vertical dipoles. A CDXC member directed me to the site by F4BKV recently that has more details. I did not try to work VP6DX when on their trip but I heard them, and I have used vertical dipoles by the sea and added parasitic elements on a separate pole and used vertical moxons and the like on trips, all worked fine and the advantages of the sea are obvious but had a draw back in that it was slow if not impossible (especially whilst operating) to amend the 'path' of maximum radation and RX signal. 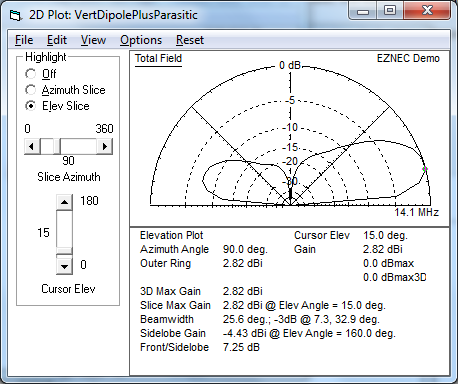 After trying a few options the most successful was a central vertical dipole and then sloping unconnected wire dipoles suspended in a sideways V format, initially taped to the antenna supports spaced 120 degrees from the centre. 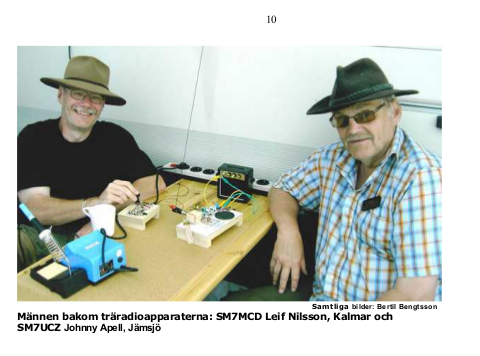 This was attempted with the guys at SK7CA field day on EU-037 with a decent central mast when they successfully used three dipoles on 17m and were able to apply the directivity. The velocity factor in all the wires is important and a lot of trimming was required to get it to work. It works but the directivity is still very broad. When I rediscovered the box of poles in the shack I thought time to look into this one more (and the idea for a /P cubic quad but more of that in a later post). Time to try and make something similar to the VP6DX (but much lighter) antennas that I could carry in 'normal' luggage. The demo version of EZNEC is adequate for this purpose and I came up with a few permutations. The real challenge was trying to work out how to support the horizontal section and to make the cross arms as light as possible without adding too much weight. The basic antenna has to use a 12m DX wire pole or one of two DX Wire short 10m poles (last were recently obtained from sotabeams). The cross members are shakespeare 4m fishing poles. One of my build is yet to be put on the scales but the construction is light. Right now these are MONO BAND ONLY. First BIG assumption, you need a good ground, I for this purpose said the ground was perfect, sea water is not exactly a perfect ground but it is very close. If you cannot get the antenna right by the sea then a vertical needs a large wire ground mat and the performance will not be as good as modelled here. I repeat if you are a mile from the shoreline forget it... you need to be RIGHT AT THE SHORELINE. 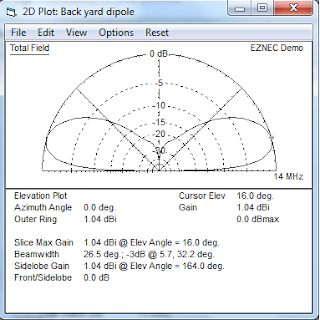 Don't believe me try a simple experiment next time you are at the seaside with your /P setup and build the simplest vertical dipole. Listen and TX right by the sea then before propagation changes too much move a mile inland (not down a river or similar) and do the same... you will soon see why renting a holiday home with sea views but a mile from the beach is great idea but for radio simply not worth it. Unless you use a different antenna. My second BIG assumption is that the path away from the antenna in the direction I want is also all sea so for several wavelengths (even better if just sea most of the way). Anyway these were the patterns I was looking for. 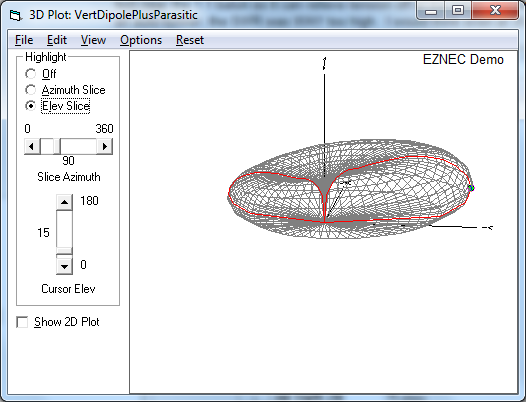 I used Conductivity (0.0303 S/m) Diel Const 20 which are EZNEX Very Good Ground values. In some locations the sea water is MUCH 'saltier' so these might be better, or the reverse. The antenna has a lot of forward directivity, also notice a major null 180 degrees in the reverse direction. This is useful for so many reasons the major one being to null out qrm/qrn and it also means you will be able to tell if you have Short Path or Long Path propagation. Which for DX trips matters! Your antenna site may have to be carefully chosen , Google Earth can help you a lot before you get there (a 5 minute decision whilst driving past also works!) so if you can put NA/JA or EU etc into this main lobe you will have a lot more success. Hint: REMEMBER TAKE A COMPASS AND A GREAT CIRCLE MAP FOR THE DXCC YOU WILL BE IN. Buy a compass and put it in your /P kit bag. On EU-138/EU-029 at times it would have been useful to be able to null out RA/UT stations 'behind me' as I was working NA. Likewise EU as I was working JA. I am sure I do not have to explain this to those who have used directional antennas before. On KH8 I found a perfect NE shore beach and I operated from there, placing my vertical dipoles on the beach and my tiny (to some) qrp signal, did manage some EU/UK qso it might have sounded so much louder with one of these. I'd rather add dB to the antenna signal strength and not dB to the TX output. Multiple reasons but I am a QRP fan and that means you can operate often without any electrics and only batteries. 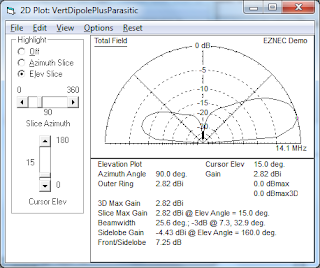 As per the vertical Moxon experiments I did a while back (search blog for Moxon) and that Pete M provided analysis for (put link here) you will not that over a perfect ground the angle of maximum radiation is very low. Got an old (ish) laptop and going to add it to shack QTH and KX3 setup as a generic SDR panadapter. I have a nice USB sound card (48 KHz 24 bit) that has an isolated input adapter (simple 1:1 isolation interface) and the laptop seems to run SDR# http://rtlsdr.org/softwarelinux on the laptop (Linux Ubuntu) (screen shots to follow). I also have a USB RTLSDR RX and a HF converter so I am going to set it up along side as a SDR grabber which should run on the same system. I'll add some front end BPF to the SDR when I am QRV from the shack. It is hot but taken all I have learnt on trips and starting to put antennas up. qrv on 15m this afternoon. Vertical dipole, with parsitic dipole (so 2el) can switch between EW and WE qrp (5W) rbm immediately picked up by W3LPL.